PUIG CRASH PADS R12 MODEL FOR HONDA CB600F HORNET YEAR 2012 COLOUR BLACK. PUIG CRASH PADS R12 MODEL FOR KAWASAKI Z750 YEAR 2004 COLOUR BLACK. PUIG CRASH PADS R12 MODEL FOR SUZUKI GSF1250S BANDIT YEAR 2011 COLOUR BLACK. BMW R1200GS 13-19 R1250GS 18-19 R&G Motorcycle Headlight Shield. A cost affective way to protect your headlight. Founded in 1999 after honing their products in racing, R&G make a huge variety of products for all manner of motorcycles. HEED Poland. Painting: powder coated. All our products have 2 years warranty. No interference with the structure of the motorcycle. Cutting: laser. For KTM 1290 Super Adventure 2015-2019. -- Type: Engine Case Slider. 1 Pair x Engine Case Slider (Right & Left). Fix the cover on original engine casing by screw. For KTM 1090 Adventure 2017-2019. For KTM 1190 Adventure 2013-2019. THIS SALE IS FOR 1 TWM BRAKE LEVER GUARD - IN RED. Fits any hollow end bars from 15-17mm I.D. Made in Italy. RRP £69.24 ! Precisely fitting design - specially developed for KTM models. ENGINE GUARD/SKID PLATE. Part Location: 401-6-2-1. Part Number: K47103990000. BARGAIN PRICE. GENUINE PARTS. TRIUMPH SCRAMBLER 865 EFI / CARBS BLACK ENGINE DRESSER BARS. SCRAMBLER CARBS. Engine Dresser Bars in durable textured black finish. SCRAMBLER EFI. a must have accessory for Scramblers! nd Class depending on what service you select. For KTM 1090 Adventure 2017-2019. -- Type: Engine Case Slider. 1 Pair x Engine Case Slider (Right & Left). Fix the cover on original engine casing by screw. For KTM 1190 Adventure 2013-2019. For KTM 1290 Super Adventure 2015-2019. The skid plate is made of steel plate and powder coated in silver. In front part it is mounted on the bracket from the installation kit. In the rear part it's mounted on rubbery shock absorbers used to mount a factory skid plate. Cover is made from steel plate and powder coated in black. In front part it is mounted on the bracket from the installation kit. In the rear part it's mounted on rubbery shock absorbers used to mount a factory skid plate. RRP £80. 70! Precise fitting design especially for KTM models. ENGINE GUARD/SKID PLATE. Part Number: K77403190000. BARGAIN PRICE. GENUINE PARTS. Made from special high-strength plastic. HEED Poland. Bending: CNC. Painting: powder coated. All our products have 2 years warranty. 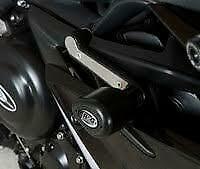 Theseaero style swingarm pivot lower crash protectors are suitable for the Kawasaki ZX6R 636 2012-2019. R&G manufacture and market individual, bespoke designs for over 200 models of motorcycle. These are not "mushrooms"! The cover is made from steel plate and powder coated in black. CRASHBARS - the official distributor of HEED products. All our products have 2 years warranty. Material: Made of 2 mm thick steel. KTM 790 Duke 2018 > On. They also function as paddock stand bobbins, allowing the bike to be lifted up on a Rear Paddock Stand for cleaning and maintenance. These spindle sliders (Pair) mount directly through the rear spindle axle. GIVI PART NUMBER: TN392. 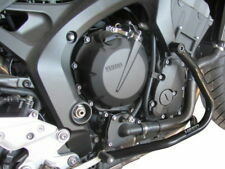 GIVI ENGINE GUARDS. GSX750 (X). GSX750 INAZUMA. engine crash bars for SUZUKI GSF600 BANDIT 1996-2004. black colour. corrosion resistant powder coating. manufactured in Italy to the highest standards with an unsurpassed fit and finish. HONDA CBF 1000 ABS. CLASSIC-STYLE CRASH PADS. Material: Steel core and mounting brackets. Nylon body. • The product is sold with regular invoice and manufacturer's warranty. • We encourage you to check the manufacturer's website for more information by referencing the manufacturer's part number. Fits BMW S1000RR 2010-2011. The kit includes two bobbins, mounts, all necessary fixings, and fitting instructions. Using the bike’s original mounting points, they are easy to fit and you won’t have to modify your bike in any way. Keep your bike protected in the event of an accidental drop/fall with this tough engine guard. Made from heavy-duty iron to ensure durability in case of an impact. If there are any problems or delays with your order we will notify you within 24 hours of the order being placed. CRASHBARS - the official distributor of HEED products. 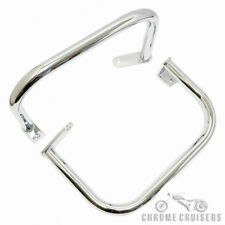 Steel engine guard in silver for BMW G 650 GS. It's compatible with centre stand. All our products have 2 years warranty. Material: steel. Kit includes all necessary parts for installation. CLASSIC-STYLE CRASH PADS. 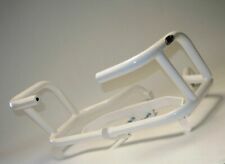 BMW F 800 S. Material: Steel core and mounting brackets. Nylon body. • The product is sold with regular invoice and manufacturer's warranty. • We encourage you to check the manufacturer's website for more information by referencing the manufacturer's part number. SUZUKI GSXR 600 K4 K5. CLASSIC-STYLE CRASH PADS. Material: Steel core and mounting brackets. Nylon body. • The product is sold with regular invoice and manufacturer's warranty. • We encourage you to check the manufacturer's website for more information by referencing the manufacturer's part number. R&G Aero Bobbins are a stylish, aerodynamic, teardrop shaped bobbin improving on the original good looks of highly successful and popular standard round bobbins. HONDA CB 600 HORNET. AERO-STYLE CRASH PADS. For KTM 1290 Super Adventure/R/S/T 2015-2019. -- Type: Engine Case Slider. 1 x Right Engine Case Slider. Fix the cover on original engine casing by screw. For KTM 1050 Adventure 2015-2018. For KTM 1090 Adventure 2017-2019. SUZUKI BANDIT 600. CLASSIC-STYLE CRASH PADS. Material: Steel core and mounting brackets. Nylon body. • The product is sold with regular invoice and manufacturer's warranty. • We encourage you to check the manufacturer's website for more information by referencing the manufacturer's part number. R&G Aero Bobbins are a stylish, aerodynamic, teardrop shaped bobbin improving on the original good looks of our highly successful and popular standard round bobbins. Suitable for the Kawasaki ZX6R 636 2019. They can also be used on Tiger 855i T 709(99-00). CRASHBARS - the official distributor of HEED products. Painting: powder coated. All our products have 2 years warranty. Welds: TIG. PUIG CRASH PADS MOD. R12 DUCATI MONSTER 1200/S 2017 BLACK. PUIG CRASH PADS MODEL R12 FOR DUCATI MONSTER 1200/S YEAR 2017 COLOUR BLACK. Equipped with a black nylon body and a grey rubber pad. Internal part and brackets made of steel, screws kit included, sold in pair. M6 Cotton Reel Protection and paddock stand bobbins. R&G Racing CR0002BK. 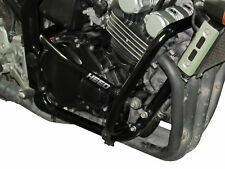 For Honda Rebel 250 CA250 CMX250 CMX250C Engine Guard Crash Bar. For Honda Rebel CA250 (1986-2012). For Honda Rebel CMX250 (1986-2012). For Honda Rebel CMX250C (2003-2012). 1x Engine Guard Crash Bar. 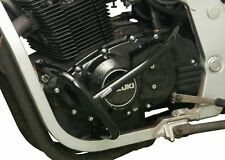 -Type:Engine Guard Crash Bar. YAMAHA FJR 1300. CLASSIC-STYLE CRASH PADS. Material: Steel core and mounting brackets. Nylon body. • The product is sold with regular invoice and manufacturer's warranty. • We encourage you to check the manufacturer's website for more information by referencing the manufacturer's part number. HONDA CBR 1000 RR FIREBLADE. CLASSIC-STYLE CRASH PADS. Material: Steel core and mounting brackets. Nylon body. • The product is sold with regular invoice and manufacturer's warranty. • We encourage you to check the manufacturer's website for more information by referencing the manufacturer's part number. PUIG REAR FENDER EXTENSIONS FOR YAMAHA MT-09 TRACER YEAR 2018 COLOUR MATT BLACK. Material: ABS plastic. This useful accessory will allow you to extend the rear fender and protect your bike from spray, mud and stones. R&G Aero Bobbins are a stylish, aerodynamic, teardrop shaped bobbin improving on the original good looks of highly successful and popular standard round bobbins. AERO-STYLE CRASH PADS. Material: Steel core and mounting brackets. Cover is made from steel plate and powder coated black matte. CRASHBARS - the official distributor of HEED products. All our products have 2 years warranty. Material: Made of 2 mm thick steel. R&G Aero Bobbins are a stylish, aerodynamic, teardrop shaped bobbin improving on the original good looks of our highly successful and popular standard round bobbins. Suitable for the Kawasaki Versys 1000 2019. DUCATI HYPERMOTARD 1100. CLASSIC-STYLE CRASH PADS. Material: Steel core and mounting brackets. Nylon body. • The product is sold with regular invoice and manufacturer's warranty. • We encourage you to check the manufacturer's website for more information by referencing the manufacturer's part number. SUZUKI GSXR 750. CLASSIC-STYLE CRASH PADS. Material: Steel core and mounting brackets. Nylon body. • The product is sold with regular invoice and manufacturer's warranty. • We encourage you to check the manufacturer's website for more information by referencing the manufacturer's part number.